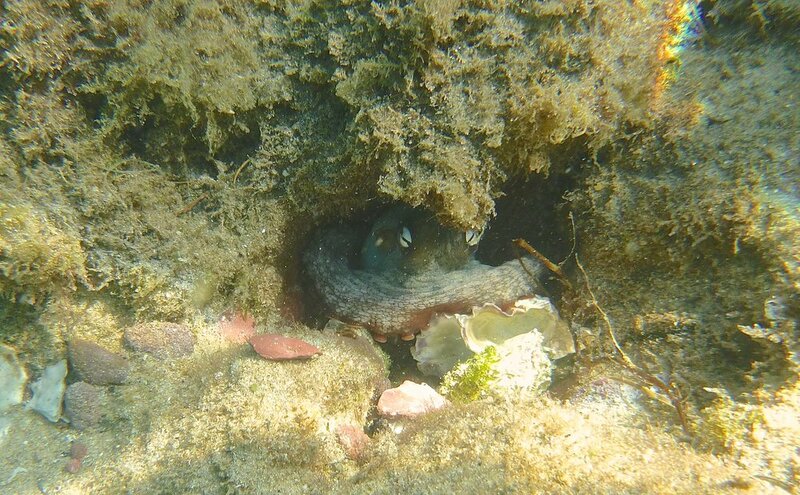 The water is still warm enough & clear enough to see plenty of activity around Bar beach,Merimbula,quite a few Gloomy Octopus [Octopus tetricus ] and many small fish including tropicals. This dark coloured octopus had one tentacle down a crevice where another octopus was seen ....maybe mating ,the dark colour might be an indication of aggression ,was pale when first spotted ,then he changed colour & made himself look larger....and more like Ecklonia radiata [ common kelp ].Amazing creatures to watch. Girdled Parma & White Ear juveniles.